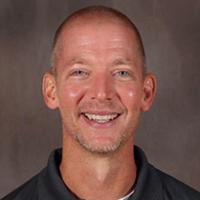 Since graduating from college in 1995, James Haveman has been involved in education as a teacher and coach. He joined the staff at Alpha Omega Academy in 2005, and currently serves as the health and physical education teacher. Haveman said communicating with students is the most enjoyable part of his job. “It is fulfilling when I go the extra mile to help a student reach success and they find it,” he said. Born in Rock Valley, Iowa, Haveman describes his childhood as being full of activity. He and his four siblings were raised by Christian parents in a warm, safe home. Today, Haveman’s hobbies include anything that involves spending time with his wife and three boys. The Haveman family enjoys an active lifestyle that includes several sports and activities. They’re also actively involved in their church. “We enjoy our church family and the life that comes with being a part of a congregation of believers,” he said. Some of Haveman’s favorite things include Chinese food, basketball, the movie Hoosiers, and the song New Hallelujah by Michael W. Smith. His most treasured possession is God’s Word, and he identifies Ephesians 4:32 as his favorite Bible verse.